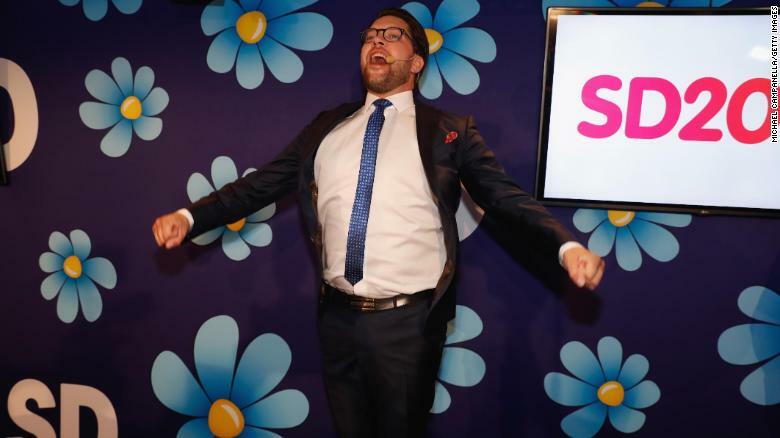 Leader of the far-right Sweden Democrats Jimmy Akesson reacts to the results of the exit polls at the party election center, Kristall restaurant on September 9, 2018 in Stockholm, Sweden. Swedes have headed to the polls in a tightly contested general election where immigration has been a central issue of a heated campaign and which could see the far-right Sweden Democrats make significant gains. 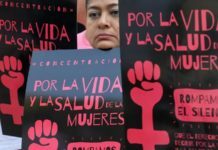 A month – it’s almost too long to remember or care about. The Swedish election has fallen from the international news-circuit, which is understandable for a minor European nation. A couple of weeks ago, there was an unusual amount of international attention given to the Swedish elections of 2018, indicating an increased international viewership interest. Is there a genuine international interest in the national politics of Sweden? – That would be an absurd notion. Could the inner-politics of a small to mid-sized EU member-state garner such interest from other Western nations by virtue of its own political contradictions? Again, absurd. Something is amiss in the foreign-language press’s coverage of the Swedish elections. The post-election analyses that were trotted out spoke of a silent disappointment. The election-results were, in loss of so many words, boring. A great disappointment for the foreign-news-consumers, or as they should be called, doom-watchers. Doom-watchers are novel creatures in the news-media landscape. They emerged from the experimental vats of world history due to two recent developments. The first being the crisis of confidence in, and infighting amongst, the establishment classes of the liberal West. The second development consisting of innovations within social media technology. The political anxieties in the West are with the aid of instantaneous communication rendered into a perpetual discourse of simultaneous hysteria and contempt. This coincidence of politics and technology has yielded a form of political experience that projects domestic symbolic conflicts upon foreign surfaces for a perverse sense of anticipatory dread and/or excitement. Funny thing; grand narratives have apparently returned, if they ever truly went away. But, these grand narratives have become subsistent on consuming smaller narratives. Headlines that read ‘What does the Swedish election tell us about populism?’, ‘Sweden’s elections signal a turn toward far-right’ or ‘Election in Sweden proves tenacity of liberal institutions’ privileges the grammatical object over the foundational noun. The doom-watcher’s news consumption is restricted and gratified by this mode of reporting. An election in Sweden is not interesting to the doom-watcher because it occurs in Sweden, it is of interest because it can be subsumed into larger binary narratives of populism vs establishment, liberal society vs authoritarianism, globalism vs nationalism, social-democracy centrism vs left-wing challengers, etc. The doom-watcher is given material through events in the news, usually parliamentary elections due to their cohesive structure and clear outcomes, that acts as referendums and indicators of larger abstract meta-struggles. Too bad the Swedish elections proved to be such a dud. How come the Swedish elections proved insufficiently entertaining for most doom-watchers? Let’s review the inconclusive results. As it stands, the election on the 9th of September resulted in a complicated tie. The Swedish parliament (Riksdag) has a total of 349 seats which are distributed according to the percentage of votes that each party accrues in the national election, city and regional elections are held separately. Sweden has a multi-party system with eight national parties currently represented in the Riksdag. 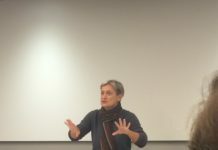 Seven of these parties are divided into two political blocks: The Swedish Social Democratic Party (SAP), The Green Party (MP) and The Left Party (V) form the left-centre block. The Moderate Party (M), The Liberal Party (L), The Centre Party (C) and The Christian Democrat Party (KD) make up the centre-right block. Outside of these opposing coalitions stand the much written about Sweden Democrat Party (SD), known for its outspoken opposition to perceived liberal immigration and assimilation policies as well as some of its founding members’ ultra-right backgrounds. 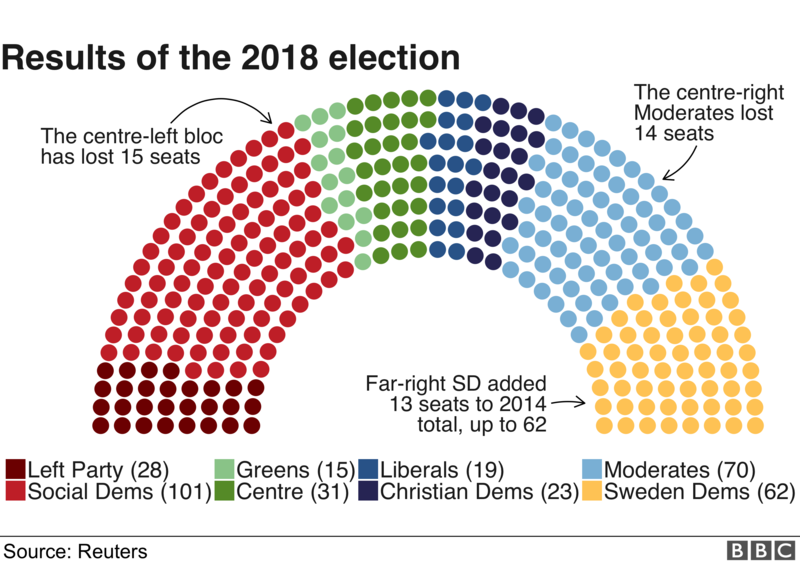 Currently, the centre left holds 144 seats and the centre right has 143 seats, the remaining 62 seats going to the Swedish Democrats. So, the centre-left won? No, certainly not. They maintain a majority only when discounting the Sweden Democrat held seats. The Sweden Democrat party leadership is very keen on reforming the right-wing block, excluding the purportedly squeamish market-liberal Centre and Liberal parties, in order to form a conservative block with the remaining parties. 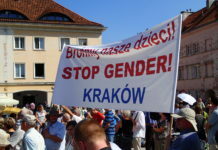 However, such a coalition would not produce a majority of seats if the excluded liberal parties decided to enter into an alliance of necessity with the centre-left. Back to deadlock. Fact is, the results of the elections will in all likelihood be played out over an extended period that may or may not include the reconfiguration of the now 14-year-old block party system. But this will be tedious, boring and very hard to decipher, especially for a foreign audience. Was the election then a complete non sequitur? – No, the election will surely mean considerable changes, but they are either fundamentally inaccessible to an international audience (perhaps even to a Swedish one) or they were just too darn disappointing when compared to more sensationalistic counter-factuals. In regard to the inaccessibility of the results, a brief mention of the large shift in local politics should suffice. Now, despite what some doom-watchers have concluded are the inevitable decline of the social-democratic parties of Europe; usually imagining them as top-heavy organisations, the social democratic party of Sweden still has a strong-on-the-ground presence in most Swedish cities. Nonetheless, it’s becoming increasingly clear that while their voters may support them in the national elections, the party is becoming challenged amongst its own voters in local elections, usually by newcomer parties such as the Democratic Party in Gothenburg. If things are bleak for the local Social Democratic Party then they are nothing but disastrous for small left-parties that have lost their anti-establishment credentials, losing to budding local nationalist parties in several mid-size to small cities. The point of bringing these developments to light is not to insist that they signal the ‘true’ outcome of the election, thus giving doom-watchers a chance to reabsorb a thus far indigestible narrative. What happens in the boonies of Sweden may one day have a considerable impact upon the nation as a whole, but it is still undecided. Even if the local elections were part of a larger trend, determined by some chain of events in the past, the recoil of those events have yet to fully hit. Doom-watchers, Swedish or international, may look up information about the local elections but since most local elections do not have the ‘evental’ weight of a national election, it remains hard to balance their high-expectations of the outcome with the political reality. 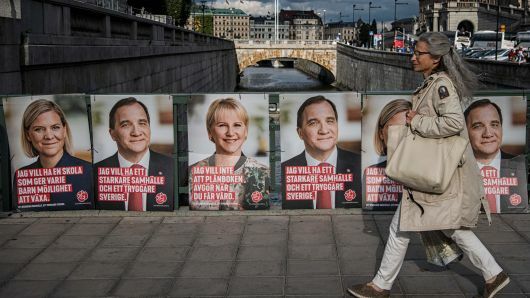 A woman walks next to election posters of the leader of the Social Democrats and Swedish Prime Minister Stefan Loefven, Swedish Minister for Finance Magdalena Andersson (L) and Sweden’s Foreign Minister Margot Wallstrom on September 1, 2018 in Stockholm. “[…] Sweden is in real trouble. We have been in trouble many times in our history. It has seemed hopeless many times. Our country has been occupied by foreign states, foreign magistrates have oppressed the people, we have been attacked and stood alone against the collected might of Europe’s great powers and been at a crushing disadvantage in numbers. And yet, we have always resisted, we have always risen up, we have always won against all odds and survived. Thanks to the unshakable stubbornness, resolve, will to sacrifice and leadership of a small number of patriots. We must be those patriots now. Fate has elected us this time. 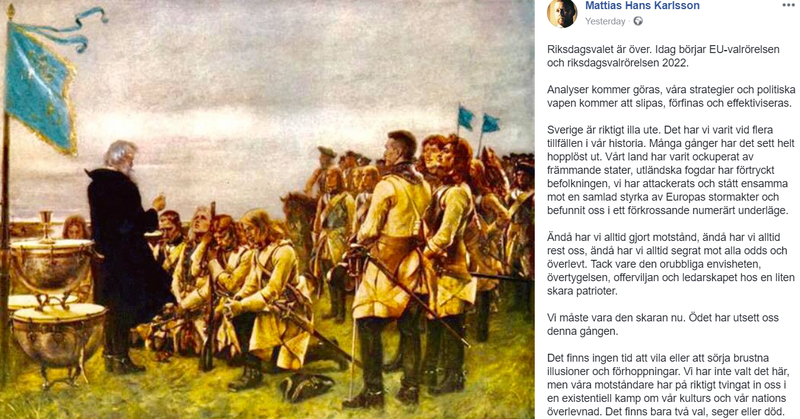 The reaction of most Swedish commentators to this post have either been to make fun of it for its overtly bombastic rhetoric or to be outraged by its open antagonism and usage of military terms to describe a democratic election. Yet few have noticed the conciliatory undertones that hide behind the hyperbole and bluster. Karlsson is clearly addressing the fact that most of his constituents seemingly expected a solid victory. The party leadership of the Sweden Democrats are not inept in terms of manipulating their base of support and Karlsson’s post shows the leadership’s need for the base not to get lost in obsessing over dissatisfactory outcomes. The danger being of course that an active voter base should not simultaneously over-indulge in passive doom-watching. Indeed, the Swedish elections were a disappointment for any international viewer, whether left or right, who wanted a clear resolution. The international post-election media editorials reflect this, reneging on their previous promises of great victories and defeats. Fact is, this is the recurrent sad pattern of doom-watching. There are of course great political victories and defeats, no doubt. But the political framework of parliamentary democracy can rarely deliver the true heights that the doom-watchers seek. The 2016 upset victories of Donald Trump in America and the Pro-leave movement in the UK were great and profitable media-spectacles. One American CEO put it bluntly “It may not be good for America, but it’s damn good for CBS”. Despite this economic desire of news-producers to reproduce these upset elections, most political elections will fall short in dramatic content. Looking for alternative content to dramatize, even diplomatic meetings are given the 2016-treatment, which news-producers have reshaped into win-or-lose narratives. They usually fail in their attempts. For instance, what did Donald Trump’s meeting with Kim Jong-Un in Singapore in June concretely result in? Nothing that can be easily perceived as a ‘clear win’ or ‘crushing defeat’. It doesn’t therefore satisfy the needs of doom-watcher. Having been fed on sensationalist reporting, the doom-watcher demands recognisable shifts in world history. A meeting between leaders that is not an equivalent to the Yalta conference of 1945 simply will not do. Nor will the conclusion of military conflicts, such as the steady de-escalation of the Syrian Civil War, provide any satisfactory conclusion for doom-watchers whose poor western historical imagination only contain 20th-century-style unconditional victories or surrenders. Thus, the doom-watcher clenches its teeth at each inevitable ambiguity in political events that the foreign press fails to capture. As the original doom-watcher Gary Brecher (a satirical op-ed writer created by John Dolan) has taught us, one can easily imagine the doom-watcher whispering to itself “come on you cowards, destroy each other” when realising that the promised spectacle won’t deliver the awaited thrill. Mutual destruction or at least acts of military aggression are clearer narrative markers than election results and conferences. This nihilism is a result of the fact that the doom-watcher is not in any way materially impacted by the narratives it consumes. It is thus easy for the doom-watcher to encourage foreign politics by way of fervent interventionism, right-wing authoritarianism or for the spread of ‘open-market societies. Again, it is not the ideological content that defines a doom-watcher but the mode of interaction with the news-narratives it consumes. These news-narratives, creations of the modern 24 hour news-cycle, generate doom-watching because they willingly infuse news-items with a sugar-coating of historical continuity. History is however a fickle thing that isn’t so easily captured. It has the absurd abilities of a cartoon character in that it can seemingly be captured by a reportage or exposé, only to reappear somewhere completely unexpected, whilst the unlucky news-reporter is left holding a dummy made up of lit dynamite-sticks adorned with a cheap wig and lipstick. The prognostications about the impact and import of news-items produced by the press creates a false sense of assuredness that all events fall into a consecutive time-line and that all political events are transparent in terms of meaning. Naturally, such an assumption is false. Yet news-producers continue in their attempts at capturing world history with the aid of a butterfly catcher for the amusement of its doom-watching audience. Returning to the Swedish elections, we can clearly see the dangers of doom-watchers, or perhaps ‘news-junkies’ as they themselves perhaps prefer to be called, because of their inability to grasp a model politics that isn’t easily perceivable as a string of ‘game changing moments’. The Swedish elections of 2018 will surely in some way be a game changer of sorts, but it cannot as of yet be properly understood as a historical development. There are already long running trends within Swedish society such as increasing economic inequality, political disagreements over immigration, conflicts between urban-centre and rural periphery and an embattled school system that the election results give no clear answer to. However, all of these trends might not be causes for anxiety providing that politicians discount the narratives that are circulated in the press. Sadly and most disconcerting, is that the overall development is lurching the other way with politicians themselves becoming news-junkies, doom-watchers, or whatever one might call them. 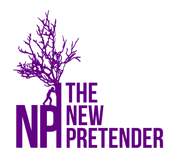 Instead of actively structuring political realities, future politicians might opt to submerge themselves into what they think is the natural chain of events, as presented by news-outlets, only to be hit by a concrete complexity that they are uncapable of confronting. A far-away future perhaps, but close enough that one may venture just like today’s journalists that it will be interesting to follow. Never learning its mistake: is Hollywood on replay?